One of the many advantages of being a member of the KAS is access to its library. The book, CD-ROM, and DVD collection is kept on a cart at the Kalamazoo Area Math & Science Center. 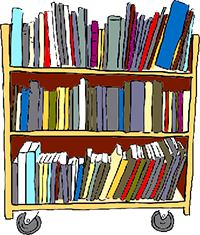 Items from the library are available for check out at most general meetings. All you need is your current membership card. To borrow a book, write the date, your name and phone number on the back of the card in the space provided. Place the card in the black card box. Normally the book will be due at the next meeting. To renew just resign and date the card. Return the books to the “Return Books Here” area on the cart. We also have periodicals. Our extensive collection of Astronomy and Sky & Telescope magazines is now kept at a separate storage facility due to space and weight issues. If you would like a specific issue or issues please contact the librarian (details below) at least 24 hours before the next general meeting. To check out a magazine, write the date, name, phone and magazine name and date on the Magazine Check out Sheet on the cart. We welcome additions, especially newer books on any aspect of astronomy, space science, or space exploration. Our magazine holdings are listed below. We would like to fill the gaps but don’t want duplicates. If you really need them out of your house we suggest senior centers or senior housing, many of which have reading rooms/libraries. Who knows, maybe a KAS member would want to add them to their collection. by Richard Berry, et. al. Norton’s 2000 Star Atlas and Reference Handbook 18th ed. Bad Astronomy: Misconceptions and Misuses, from Astrology to the Moon Landing "Hoax"
The Essential Cosmic Perspective 3rd ed. Horizons: Exploring the Universe, 7th ed. Horizons: Exploring the Universe, 9th ed.